What to do with all the spam comments?? I know for sure that I am not the first one with this problem so I will turn to some of you who have been blogging seriously for a longer time. I am very busy these days working and blogging used to be the time where I could relax and focus on something different than work, but recently all this spam has gotten to me and I am feeling very annoyed about it. I even considered deleting my blog the other day – just to clear out all that spam!! Please help me – what do you do to prevent/ignore all that spam? An please, share my frustrations with your fellow blog friends if you think they might be of any help to me…. Time is running and we have already been in lovely perfect Roswell, GA for 3 month today. Compared to the first month we cook a lot now – actually I think that we cook al lot more than anyone else in our neighborhood. I really don’t understand how some people can eat out everyday, and sometimes more than one time each day. That is so different from our culture where people eat at home every day and only go out on special occasions. Well, as i said we cook a lot more now than we did in the beginning of our new US life, but we still need a lot kitchen supplied to be up to date with our old kitchen back in Denmark. Until we are back at track everything is a little slow – even the blogging. However, I do have some easy recipes that I will try and put up during the next couple of weeks. Mix all the ingredients in a bowl and pour onto a baking tray covered with baking paper. 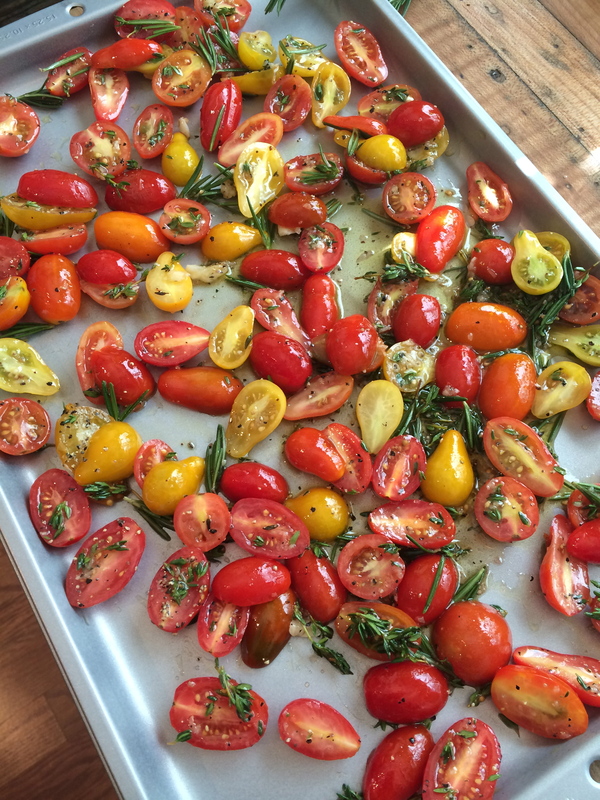 Make sure that the cutting surface of the tomatoes is turning up – otherwise they will bake differently. Place in a pre-heated 250F degree oven and let bake. Check after 2 hours to see if they have dried enough. If not, check again every 8-10 minutes until they have the wanted texture (I like mine to be a little soft , but every one is different 🙂 ). Pull out of the oven an leave to cool. 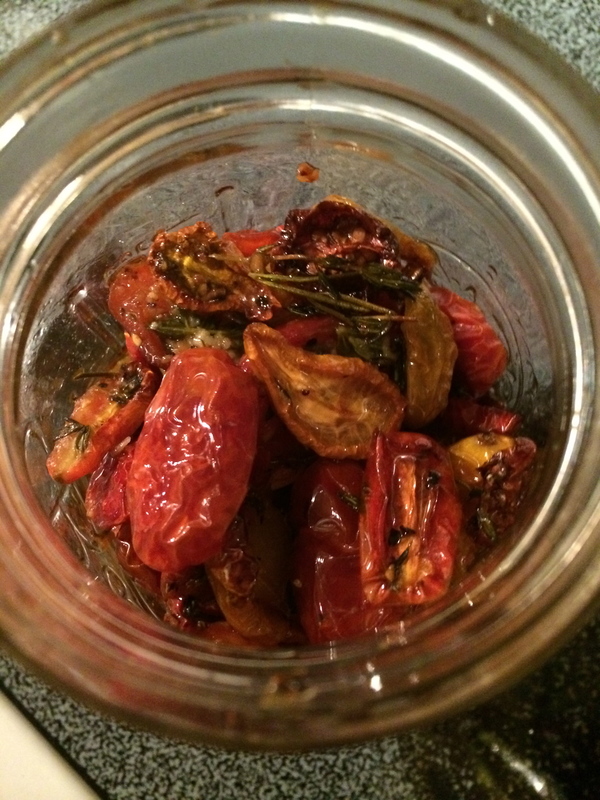 Transfer to an air tight jar, e.g. 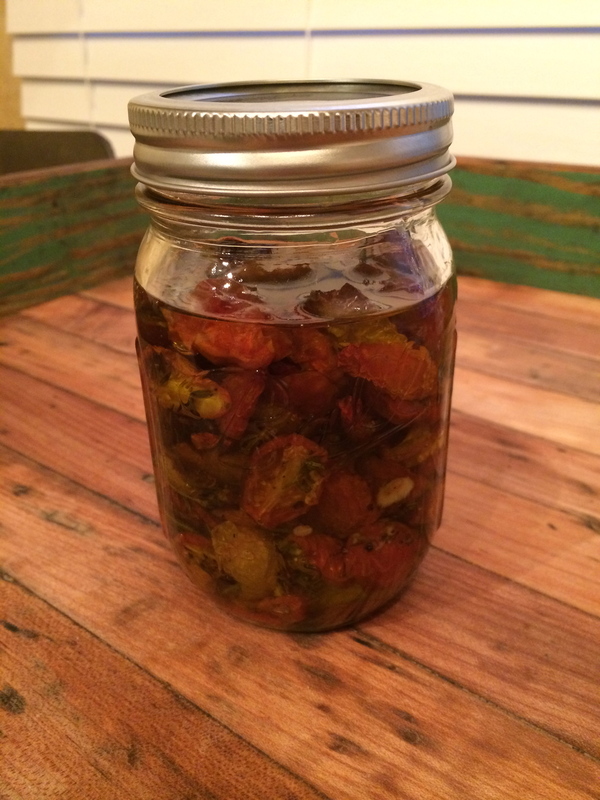 Mason and pour Extra Virgin Olive Oil until all the dried tomatoes are covered. Refrigerate for up to two weeks.